If you use OS X, you may have heard of LaunchBar, a system utility that makes it easy to launch applications, search web sites and have multiple copy and paste buffers. If you use LaunchBar, you might find this documentation tip useful. I'm going to show you how to add your own index so that you can use LaunchBar to quickly search the Real Software Documentation wiki. If you haven't already, open LaunchBar by pressing Command+Space. In the drop-down window type "wiki" and then a space. Now you can type a search term and press return to open a browser at wikipedia with the topic you specified displayed. You can easily do the same thing for the Real Studio Documentation Wiki. First, open the LaunchBar window and click the gear icon. In the menu select Index and then Show Index. This opens the LaunchBar Index window. 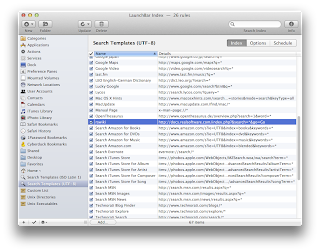 Towards the bottom of the sidebar you will see an entry that says "Search Templates (UTF-8)". 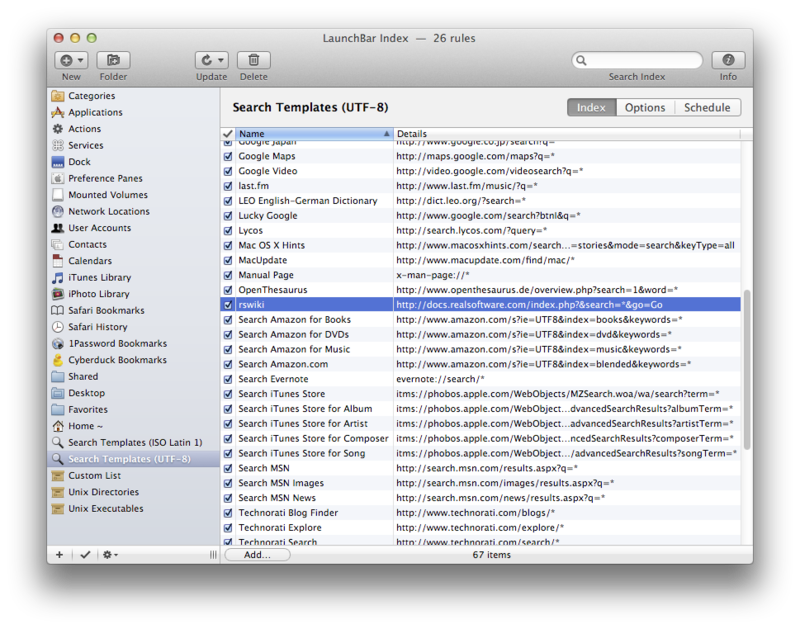 Click on that to see all the search templates. Click the "Add.." button to add your own template. Now bring up LaunchBar again with command+space. Type "rswiki" and a space. Enter your search term (such as "WebListBox") and press return. The documentation wiki will appear in your default web browser at the WebListBox page.